COMMENTS:        This trigger occurred at longitude,latitude = 151.08,-15.91 [deg]. COMMENTS:        NOTE: This BAT event is temporally(7.0<100sec) coincident with the FERMI_GBM event (trignum=498141079). COMMENTS:        This trigger occurred at longitude,latitude = 104.50,25.20 [deg]. Dec(J2000) = +07d 29' 09"
with an uncertainty of 3 arcmin (radius, 90% containment, including systematic uncertainty). The BAT light curve shows any short peaks with a total duration of about 35 sec. The peak count rate was ~3200 counts/sec (15-350 keV), at ~1 sec after the trigger. The XRT began observing the field at 12:33:24.5 UT, 121.8 seconds after the BAT trigger. No source was detected in 574 s of promptly downlinked data, which covered 0% of the BAT error circle. We are waiting for the full dataset to detect and localise the XRT counterpart. No UVOT data is available at this time. We note that this BAT trigger time is within 7 sec of a Fermi-GBM trigger (trigger= 498141079). We searched for the optical counterpart of GRB 161014A (J. L. Racusin et al., GCN Circular #20035) with the optical three color (g', Rc, and Ic) CCD cameras attached to the MITSuME 50 cm telescope of Akeno Observatory, Yamanashi, Japan. with an uncertainty of ~0.4 arcsec. We obtained the following magnitude in Rc band. with a 1 arcsec error radius and a magnitude of i~18 as calibrated against nearby SDSS stars. We began to observe GRB 161014A (Racusin et al., GCN 20035) with Xinglong 0.8-m TNT telescope at 2016-10-14, 12:33:03(UT), about 100 sec after the Swift trigger time. The new source reported by Morita et al., (GCN 20036) and Guidorzi et al., (GCN 20037) was clearly detected in the white images. Preliminary analysis shows that the brightness of the optical afterglow in R band is about 15.02 mag, calibrated by a nearby USNO B1.0 object (22:10:31.5, +07:28:47, J2000, R=13.78mag), at the mid time of 110 sec after the burst. We performed R band imaging observations around the error circle of GRB 161014A (Racusin et al., GCN 20035) with the optical imager HOWPol attached to Kanata telescope of Hiroshima University. The observation was made at 2016-10-14 12:32:48 UT (mid time of the observation). We detected the optical transient reported by Morita et al. (GCN 20036), Guidorzi et al. (GCN 20037) and Xin et al. (GCN 20038) in our R-band image. The detected magnitude and five sigma upper limit (in Vega magnitude) of the OT are listed below. UVOT took a settling exposure of 9.8 seconds with the v filter starting 109 seconds after the BAT trigger. We find a source consistent with the position of the afterglow reported by MITSuME (Morita et al GCN Circ 20036) and LCOGT FTS (Guidorzi et al., GCN Circ. 20037). The estimated magnitude is 16.52. No correction has been made for the expected extinction corresponding to E(B-V) of 0.08 in the direction of the burst (Schlegel et al. 1998). We observed the afterglow of GRB 161014A (Racusin et al., GCN 20035,=20 Morita et al. GCN 20036, Guidorzi et al. GCN 20037, Xin et al.=20 GCN 20038, Nakaoka et al. GCN 20039, D=E2=80=99Avanzo et al. GCN 20040,=20 Mazaeva et al. GCN 20042) with OSIRIS at the 10.4m GTC telescope on=20 La Palma (Spain). The observations started at 20:52 UT (with an average=20 epoch at 8.8 hr after the burst) and consisted of 3 x 900 s spectra using grism R1000B, which covers the spectral region between 3700 and 7800 AA=20 at a resolution of R ~ 1000. The spectrum has a low signal to noise ratio, but the preliminary reduction=20 with archive calibrations still reveals prominent features due to Ly-alpha,=20 SiII, CII, SiIV, CIV, AlII, and AlIII at a common redshift of z=3D2.823, which=20 we identify as the redshift of the GRB. We observed the field of GRB 161014A (Racusin et al., GCN 20035) using the ALFOSC camera mounted at the 2.56m Nordic Optical Telescope (NOT). Observations started at 21:22:59 UT on 2016-10-14 (i.e., 8.85 hr after the trigger) and SDSS g-/r-/i-filter frames were obtained with 4x300 s in each filter in a cloudy weather. In the stacked r- and i-bands we clearly detect the optical afterglow of the burst (Morita et al., GCN 20036, Guidorzi et al., GCN 20037, Xin et al., GCN 20038, Nakaoka et al., GCN 20039 and Mazaeva et al., GCN 20042). We measure a magnitude of m(r) = 21.60 +/- 0.06 AB mag at a median time of 9.44 hr post-burst, calibrated with nearby SDSS stars. The Swift/UVOT began settled observations of the field of GRB 161014A 4 ks after the BAT trigger (Racusin et al., GCN Circ. 20035). A source consistent with the optical position reported by MITSuME (Morita et al GCN Circ 20036) and LCOGT-FTS (Guidorzi et al., GCN Circ. 20037) is detected in the initial UVOT exposures. The lack of detection in the u and UV bands is consistent with the redshift of 2.823 reported by GTC (de Ugarte Postigo et al., GCN Circ. 20043). with an estimated uncertainty of about 0.9 arc sec. (radius, 90% confidence). We have been observing the optical counterpart of GRB 161014A (J. L. Racusin et al., GCN Circular #20035) with the optical three color (g', Rc, and Ic) CCD cameras attached to the MITSuME 50 cm telescope of Akeno Observatory, Yamanashi, Japan. The observation started on 2016-10-14 12:32:08 UT (46 sec after the burst) and we detected the optical counterpart in all three bands. The measured magnitudes were listed as follows. We observed the field of GRB 161014A detected by Swift (Racusin et al., GCN Circ. 20035) with the 12-inch AGU Robotic Optical Monitor for Astrophysical object - Narrow (AROMA-N) located at the Sagamihara campus of Aoyama Gakuin University. 20 images of 60 sec exposures were taken in the R filter starting from October 14 12:47:48 (UT) about 1200 seconds after the trigger and stopped on October 14 13:13:14 (UT). We do not detect the optical afterglow (Morita et al., GCN Circ. 20036; Guidorzi et al., GCN Circ. 20037; Xin et al., GCN Circ. 20038; Nakaoka et al., GCN Circ. 20039; D'Avanzo et al., GCN Circ. 20040; Mazaeva et al., GCN Circ. 20042; de Ugarte Postigo et al., GCN CIrc. 20043) both in the individual images and the stacked image. The estimated five sigma upper limit of the combined image (total exposure of 1200 sec) is ~15.9 mag using the USNO-B1 catalog. We observed the field of GRB 161014A (Racusin et al., GCN 20035) with the 3.6m Telescopio Nazionale Galileo (TNG) equipped with DOLoRes. Observations were carried out in the r-sdss filter. Observations started on Oct 15 at 00:19:03 UT (~11.8 hours after the burst) and consist in a single image lasting 120 seconds. The optical afterglow (Morita et al., GCN 20036 and GCN 20046; Guidorzi et al., GCN 20037; Xin et al., GCN 20038; Nakaoka et al., GCN 20039; Mazaeva et al., GCN 20042; Heintz et al. GCN 20044; Kitaoka et al., GCN 20047) is detected with a magnitude r(AB) = 21.5 +/- 0.3 (calibrated against nearby SDSS stars). Dec(J2000) = +07d 28' 01.9"
with an uncertainty of 1.5 arcmin, (radius, sys+stat, 90% containment). The partial coding was 13%. The mask-weighted light curve shows a complex structure starting at T-10 sec and ending at T+15 sec. T90 (15-350 keV) is 18.3 +- 2.8 sec (estimated error including systematics). The time-averaged spectrum from T-9.1 to T+12.5 sec is best fit by a simple power-law model. The power law index of the time-averaged spectrum is 1.47 +- 0.15. The fluence in the 15-150 keV band is 1.9 +- 0.2 x 10^-6 erg/cm2. The 1-sec peak photon flux measured from T+0.10 sec in the 15-150 keV band is 2.9 +- 0.6 ph/cm2/sec. All the quoted errors are at the 90% confidence level. The light curve can be modelled with an initial power-law decay with an index of alpha=0.45 (+/-0.12), followed by a break at T+1757 s to an alpha of 1.59 (+0.14, -0.13). A spectrum formed from the PC mode data can be fitted with an absorbed power-law with a photon spectral index of 1.83 (+0.11, -0.10). The best-fitting absorption column is 1.5 (+0.9, -0.8) x 10^22 cm^-2, at a redshift of 2.823, in addition to the Galactic value of 7.5 x 10^20 cm^-2 (Willingale et al. 2013). The counts to observed (unabsorbed) 0.3-10 keV flux conversion factor deduced from this spectrum is 3.7 x 10^-11 (4.5 x 10^-11) erg cm^-2 count^-1. The results of the XRT-team automatic analysis are available at http://www.swift.ac.uk/xrt_products/00717500. "At 12:31:15.91 UT on 14 October 2016, the Fermi Gamma-Ray Burst Monitor triggered and located GRB 161014A (trigger 498141079 / 161014522), which was also detected by the Swift/BAT (Racusin et al. 2016, GCN 20035). The GBM on-ground location is consistent with the Swift position. The angle from the Fermi LAT boresight at the GBM trigger time is 69 degrees. The GBM light curve shows multiple peaks with a duration (T90) of about 37 s (50-300 keV). The time-averaged spectrum from T0-6 s to T0+23 s is adequately fit by a power law function with an exponential high-energy cutoff. The power law index is -0.74 +/- 0.09 and the cutoff energy, parameterized as Epeak, is 167 +/- 15 keV. The event fluence (10-1000 keV) in this time interval is (5.4 +/- 0.3)E-06 erg/cm^2. The 1-sec peak photon flux measured starting from T0+7 s in the 10-1000 keV band is 5.7 +/- 0.3 ph/s/cm^2. We observed the field of GRB 161014A (Racusin, et al., GCN 20035) with the Reionization and Transients Infrared Camera (RATIR; www.ratir.org) on the 1.5m Harold Johnson Telescope at the Observatorio Astron=F3mico Nacional on Sierra San Pedro M=E1rtir from 2016/10 15.20 to 2016/10 15.39 UTC (16.17 to 20.80 hours after the BAT trigger), obtaining a total of 2.72 hours exposure in the r and i bands and 1.22 hours exposure in the Z, Y, J, and H bands. This source is consistent with the source reported in Morita et al., (GCNs 20036, 20046), Guidorzi et al., (GCN 20037), Xin et al., (GCN 20038), Nakaoka et al., (GCN 20039), Mazaeva et al., (GCN 20042), and Melandri et al., (GCN 20048). These magnitudes are in the AB system and are not corrected for Galactic extinction in the direction of the GRB. The long GRB 161014A (Swift/BAT observation: Racusin et al., GCN 20035; Barthelmy et al., GCN 20049; Fermi GBM observation: Bissaldi, GCN 20051) triggered Konus-Wind at T0=3D45088.321 s UT (12:31:28.321). The light curve shows a multi-peaked pulse with a duration of ~25 s. A weak, soft pulse is also seen in the burst light curve around ~T0+95 s, which KW ecliptic latitude response is consistent with the position of GRB 161014A. The emission is seen up to ~3 MeV. As observed by Konus-Wind, the burst had a fluence of (4.7 =B1 0.7)x10^-6 erg/cm2 and a 64-ms peak energy flux, measured from T0-0.032, of (1.3 =B1 0.4)x10^-6 erg/cm2 (both in the 20 keV - 10 MeV energy range). The time-integrated spectrum (measured from T0 to T0+16.640 s) is best fit in the 20 keV - 5 MeV range by a cutoff power-law (CPL) function with the following model parameters: the photon index alpha =3D -1.15(-0.48,+0.73), and the peak energy Ep =3D 226(-79,+267) keV, chi2 =3D 92/78 dof. Fitting this spectrum with the GRB (Band) function yields the same alpha and Ep with only an upper limit on beta of -1.8, chi2 =3D 92/71 dof. Assuming the redshift z=3D2.823 (de Ugarte Postigo et al., GCN 20043) and a standard cosmology model with H_0 =3D 70 km/s/Mpc, Omega_M =3D 0.3, and Omega_Lambda =3D 0.7, we estimate the following rest-frame parameters: the isotropic energy release E_iso is ~8.2x10^52 erg, the peak luminosity L_iso is ~8.7x10^52 erg/s, and the rest-frame peak energy of the time-integrated spectrum, Ep,i, is ~860 keV. 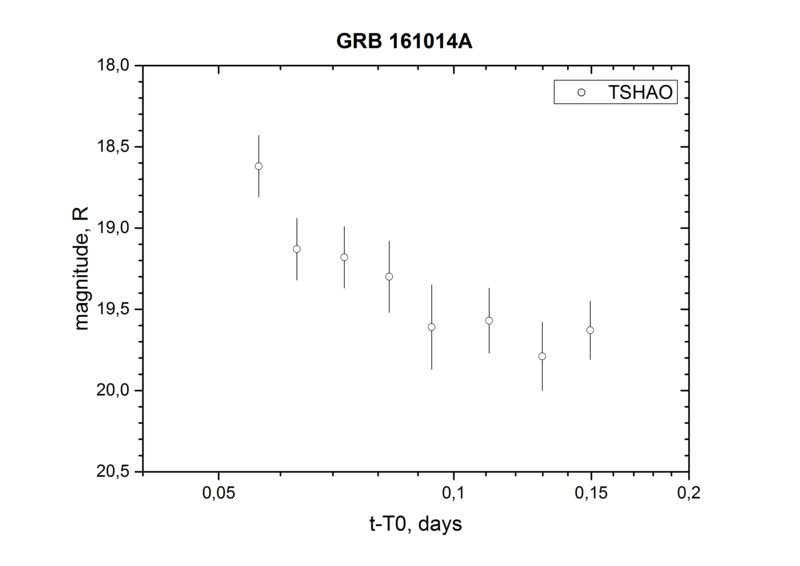 We have observed the optical afterglow of GRB 161014A (Racusin et al., GCN 20035; Morita et al. GCN 20036; Guidorzi et al., GCN 20037; D'Avanzo et al., GCN 20040), with the cross-dispersed echelle spectrograph, X-shooter, mounted at VLT/UT2. Observations started 11.6 hours after the BAT trigger and consist of 4 x 1200 s integration time in the three spectral arms of X-shooter, covering 3000 - 21000 AA. The afterglow continuum is detected in all arms at high significance. A broad absorption trough from Lyman alpha is visible at 4650 AA, along with a number of absorption lines spread across the rest of the afterglow continuum, among which we identity absorption features due to Mg II, Si II, C II, C IV, Al II, Al III, Fe II, all at a consistent redshift of z = 2.823, confirming the redshift reported by de Ugarte Postigo et al. (GCN 20043). We observed the field of GRB 161014A (Racusin, et al., GCN 20035) with the Reionization and Transients Infrared Camera (RATIR; www.ratir.org) on the 1.5m Harold Johnson Telescope at the Observatorio Astron=F3mico Nacional on Sierra San Pedro M=E1rtir from 2016/10 16.16 to 2016/10 16.26 UTC (39.29 to 41.69 hours after the BAT trigger), obtaining a total of 1.78 hours exposure in the r and i bands and 0.75 hours exposure in the Z, Y, J, and H bands. The AMI Large Array robotically triggered on the Swift alert for GRB 161014A (Racusin et al., GCN 20035) as part of the 4pisky program, and subsequent follow up observations were obtained up to 10 days post-burst. Our observations at 15 GHz on 2016 Oct 14.67, Oct 15.85, Oct 17.85, and Oct 20.85 (UT) do not reveal any radio source at the XRT location (Mingo et al., GCN 20050), with 3sigma upper limits of 225 uJy, 285 uJy, 129 uJy, and 228 uJy respectively.